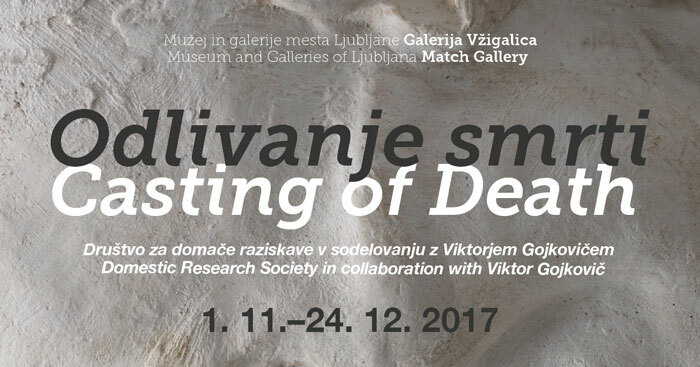 The Domestic Research Society and the Museum and Galleries of Ljubljana cordially invite you to visit an exhibition dedicated to the afterlife. What is a death mask? What is its purpose? Is it a thing of the past or part of a living, yet overlooked practice in sculpture? How many death masks are kept in public collections across Slovenia? And who are the people whose faces were cast? The casting of death masks is one of the oldest portrait sculpture techniques. Its popularity grew particularly in the 19th century with the growing assertion of the bourgeois social class, while museums also played a key part in the process. Death masks of personalities who were of major importance to the community functioned as a medium that was integrated into carefully structured political and social projects. The exhibition focuses on the very practice of casting, keeping and storing death masks, as well as their multiple purposes. The contemporary practice of casting death masks was introduced to us by Viktor Gojkovič, professional sculptor who has received the Stele lifetime achievement award for his work as a conservator. Having cast his first death mask in 1963, he has continued to do so to the present day. Some of his masks have found their way into the online database of death masks kept in Slovenian libraries, museums and archives, which the Domestic Research Society has been running in cooperation with the Institute of Contemporary History. Death masks can also serve as a source of inspiration. The Unknown Woman of the Seine has been attracting artists for more than a century (a replica of her death mask also appeared in the Plečnik’s legacy), and has, for more than a half of a century, been lending her face to the CPR training manikin. Several generations of such manikins are also kept at the Slovenian Red Cross. Jani Pirnat, Pirman Alenka and Damijan Kracina (Domestic Research Society), Marijan Rupert (National and University Library), Janez Polajnar (Museum and Galleries of Ljubljana), Marko Jenko (Museum of Modern Art), Blaž Bajič (Universitetet i Oslo, Faculty of Arts at the University of Ljubljana), Andrej Pančur (Institute of Contemporary History), and Maruša Kocjančič (project documentalist) have been researching the death-mask phenomenon within the TRACES project, funded by European Commission (Horizon 2020). The Casting of Death is the first exhibition where some of the findings will be presented. The Casting of Death exhibition is being prepared in collaboration with the sculptor Viktor Gojkovič and the Slovenian Red Cross. You are welcome to visit the exhibition between All Saints’ Day and Christmas 2017. Discussion and guided tour through the Odlivanje smrti / Casting of Death exhibition with the Traces Creative Co-production team members from Ljubljana: Damijan Kracina, Pirman Alenka, Jani Pirnat (Društvo Za Domače Raziskave), Maruša Kocjančič, Marijan Rupert (Narodna in univerzitetna knjižnica), Marko Jenko (Moderna galerija), Janez Polajnar (Muzej in galerije mesta Ljubljane) in Blaž Bajič (Universitetet i Oslo (UiO). Focus group with researcher and art educator Karin Schneider (Institute of Art Education, Zürcher Hochschule der Künste) to discuss educational approaches to the exhibition topic and learnings in the exhibit: Do you think that the approach of the exhibition can give inspirations for learning processes in your context? What should be learned? Could this learning process trigger emotions/conflicts/unease and would you find this productive and/or problematic? Are there aspects in the way research underpins the exhibition, art is understood and used, history is approached that you find inspiring for your own educational methods? What can we conclude for further educational programs? The meeting will be followed by a guided tour to the exhibition, to examine the way it speaks to the public and discuss the relevance of its proposals from an educational point of view.